Imagine that you're Walt Disney and you're coming off of 1937's Snow White and the Seven Dwarfs, a total industry game-changer; a movie that inspired a special Academy Award and caused The New York Times to write, "Thank you very much, Mr. Disney, and come again soon." How do you top yourself? Well, Disney tried to do it with Pinocchio. The studio was partially successful: the movie was a critical darling, but a box office bust. Turns out that turning a lying marionette into a sympathetic, likable character was a task even Disney struggled with. How they tried to accomplish it is just one of the 12 fib-free facts we rounded up on this 1940 classic. 1. LIKE MANY OTHER DISNEY MOVIES, IT WAS BASED ON A BOOK. The Adventures of Pinocchio was a children's book by Italian author Carlo Collodi, originally published in 1883. If you think the Disney version is dark, you should read the original—Pinocchio is stabbed by assassins and hanged halfway through the book, though he's later rescued and turned into a real boy by the "Child with the blue hair." 2. ANIMATORS WERE STYMIED ABOUT HOW TO DRAW PINOCCHIO. They were unsure whether to draw him with human movements or with wooden movements. Animators struggled for 18 months, until animation director Milt Kahl (one of Disney's Nine Old Men) decided to blend the two ideas, giving Pinocchio human-like motions, but adding puppet-like joints and screws to the mix. 3. THE PUPPET WENT THROUGH SEVERAL DIFFERENT PERSONALITY CHANGES. At one point Walt wanted him to be “fresh” and wise-cracking, similar to Edgar Bergen’s Charlie McCarthy dummy. Another version certainly wouldn’t have flown with family audiences: a “lusty” Pinocchio would have grabbed at the Blue Fairy whenever she appeared. 4. DISNEY LEGEND WARD KIMBALL ALMOST QUIT—UNTIL WALT PUT HIM IN CHARGE OF JIMINY CRICKET. 5. JIMINY CRICKET WAS INSPIRED BY A COUPLE OF DIFFERENT PEOPLE. 6. FIGARO THE CAT WAS WALT'S FAVORITE CHARACTER. Though Figaro is a relatively minor character in the movie, Walt loved the cat so much that he found another role for him when Pinocchio was over: Minnie Mouse's pet. Minnie already had a pet cocker spaniel, but it was ousted in favor of Figaro. 7. JIMINY SUFFERS A SURPRISING FATE IN THE BOOK. The cute little conscience incarnate was only a minor character in the book—and he dies when Pinocchio throws a hammer at him. It was Walt’s idea to expand the character, but he didn’t hit upon the idea until after the storymen had completed the script. They had to go back and rework Jiminy Cricket into the entire movie. 8. PINOCCHIO WON TWO ACADEMY AWARDS. Both involved the movie’s spectacular music. Paul Smith, Leigh Harline and Ned Washington won the Oscar for Best Original Score; Harline and Washington won Best Song for “When You Wish Upon a Star.” The latter, of course, has become a theme song for the Disney company over the years. 9. A SONG CALLED "HONEST JOHN" WAS CUT FROM THE FILM. Ravenscroft did appear in the movie in another way, though: He provided the roars for Monstro the whale. 10. THE MOVIE WAS A CRITICAL SUCCESS, BUT A BOX OFFICE FAILURE. Critics raved about how perfect the movie was. The Los Angeles Times critic said, “Pinocchio tops any animated cartoon I ever saw,” and The New Republic wrote that it “brings the cartoon to a level of perfection that the word cartoon will not cover.” But you wouldn’t know it from the box office. 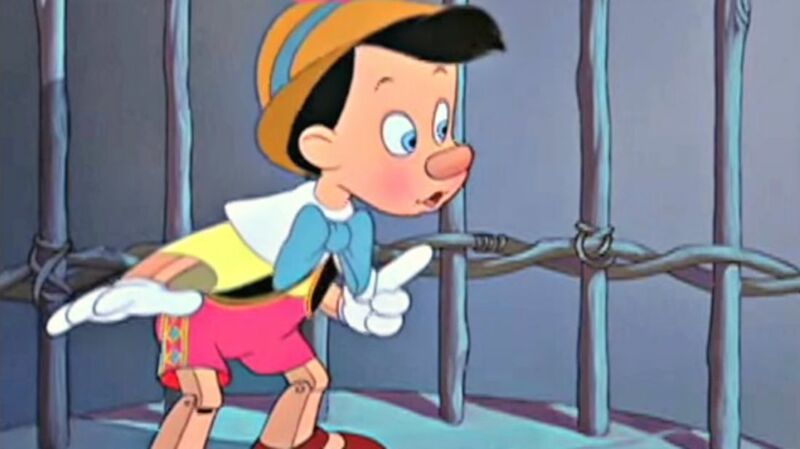 In some markets, Pinocchio barely made a tenth of what Snow White had. Walt believed the movie suffered from competition with Gone with the Wind, which had opened not long before. And he later admitted that "Pinocchio lacked an intangible something.” Critics still love the film today, by the way—it’s one of just a handful of movies to achieve a 100 percent rating on Rotten Tomatoes. 11. MEL BLANC VOICED GIDEON THE CAT. Walt hired Mel Blanc to voice the villainous sidekick character after hearing Blanc's hiccupy “drunk” impersonation. Blanc recorded all of his lines in 16 days and received $50 per day—but if you’ve seen the movie, you might remember that Gideon the Cat is mute. Disney ended up being worried that audiences would think the cat was drunk, and reduced Blanc’s lines to a single hiccup, which Blanc didn't find out until the movie premiered. Good thing he had that whole Bugs Bunny thing to fall back on. 12. DISNEY PAID FOR CLIFF EDWARDS' GRAVESTONE. Unfortunately, Edwards' drug and alcohol addiction affected his work greatly. His career began to decline, and by 1969, he was no longer in the employ of the Walt Disney Company. They did, however, quietly pay his medical bills. In the early ‘80s, someone in the company was informed that Edwards had never received a proper headstone after his death in 1971. Disney purchased a simple marker that paid tribute to “Ukulele Ike,” the persona Edwards was known for back in the vaudeville days.